class="page-template page-template-page-sections page-template-page-sections-php page page-id-941 samba_theme wpb-js-composer js-comp-ver-4.1 vc_responsive"
Hygienic, safe and cost effective. You should also ensure that the product you buy is fit for purpose. Safety flooring suitable for use in commercial areas, for example, in cafés and shops, is generally not fit for use in wet areas like showers or toilet areas. We have a wide range of non-slip, durable, and good-looking flooring solutions to match every conceivable application – and the expertise to back it up. 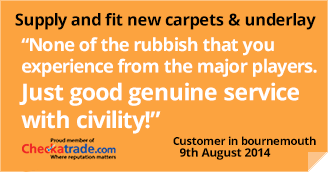 With over 40 years’ experience in the flooring industry and with a 100% feedback score on the independent Checkatrade service, you can be sure that you’ll be looked after – every step of the way. So, whether you need non-slip safety flooring for a reception area, a laboratory or a commercial kitchen, QCF Bournemouth has you covered, no slip-ups guaranteed!